I am Charlie. I am for free speech, even if it offends somebody. Indeed, free speech must necessarily offend somebody: speech that offends nobody can only be highly circumscribed. Obviously, free speech can be curtailed if it calls for violence or criminality. With that caveat, all have the right to freely express opinions (no matter how zany), or crack jokes (no matter how poor), or draw cartoons (no matter how offensive). 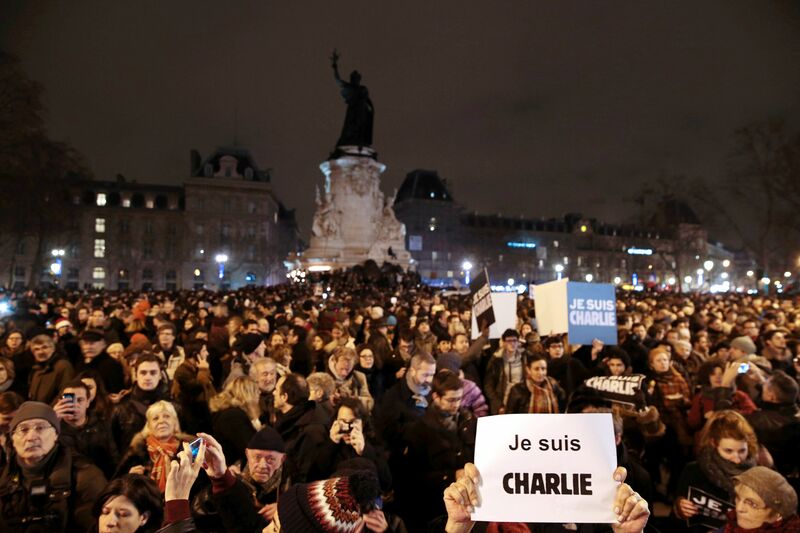 It’s now the first anniversary of the attack by Muslim gunmen on the French satirical magazine Charlie Hebdo. They shot 12 people for the sacrilege of carrying cartoons supposedly insulting the Prophet Muhammad. Shocked statesmen of the world joined French president Hollande in a march through Paris proclaiming “Je suis Charlie” (meaning “I am Charlie”), in solidarity with the slain journalists. The attempt of the gunmen to silence the cartoonists is now called the Assassin’s Veto, a threat to free speech across the world. Support for Charlie Hebdo was not universal. Many politicians and intellectuals worried about cartoons that offended Muslims. French foreign minister Laurent Fabius asked, “Is it really sensible or intelligent to pour oil on the fire?” A better approach came from Mohammed Moussaoui, head of the French Council of the Muslim Faith, who deplored “the mocking tone of the paper toward Islam and its prophet” but affirmed his “total opposition” to all violence. Anybody offended by free speech is welcome to denounce the offender, launch a lawsuit, or launch a peaceful agitation. But nobody is entitled to beat up or kill others they find offensive. All Indian intellectuals condemned the killing of the French cartoonists, but some also condemned the supposed insult to Islam. Some seemed as critical of the cartoonists as the killers. This reminds me of the hypocrisy of the Hindutva crowd that condemned Hindu mob killing of a supposed beefeater in Dadri, but added that beef-eating would naturally inflame offended Hindus and have unfortunate consequences. Liberal intellectuals have, rightly, criticized this inability to condemn Hindu assassins outright. But many liberals are also guilty of the hypocritical inability to condemn Muslim assassins outright. Indian intellectuals have recently protested against the rising climate of intolerance, and many have returned national awards. I cannot agree more on the need for tolerance. But it is wrong to emphasize only rising Hindu intolerance. Muslim intolerance must be condemned too. So must Christian intolerance, epitomized in attacks on and killings of the staff of US abortion clinics. Intolerant violence is a threat everywhere and must be condemned everywhere. Remember that on the anniversary of Charlie Hebdo. It is dishonest to pretend that different faiths have full respect for one another. On the contrary, their beliefs are insulting to one another. It could hardly be otherwise, given that each group believes its own god to be true and other gods to be false. Mahatma Gandhi held that Ishwar and Allah were different names of the same god, but millions of Hindus and Muslims would strongly disagree. Muslims believe that the only god is Allah and his Prophet is Muhammad. This is, however, insulting and blasphemous to people with other gods and prophets. Christian texts refer to Hindus, Buddhists and others as “heathen” who cannot presume to enter heaven. That is an insult. Muslims hold that Hindus and others are kaffirs unworthy of heaven, again an insult. Hindus believe that good humans are reborn into the upper castes, second-raters into the lower castes, and bad ones as mlechhas (a pariah category including Christians, Jews and Muslims) or even as dogs and pigs. How utterly insulting! So, offending religious sentiments is not an aberration that free speech can avoid. Offence is inherent in the very structure of different faiths. Tolerance lies in appreciating that one’s own beliefs are insulting to others, and hence not taking offence at others, and always avoiding violence. I belong to the small group of liberal atheists. We are not an organized religion but have beliefs and values like any faith. We find all organized religions utterly offensive: some even decree imprisonment or execution for atheists. Do I have the right to attack or kill those with such offensive attitudes? Absolutely not. Three rationalist writers and activists — Dabholkar, Pansare and Kalburgi — have been murdered in the last two years. The police have no clue whether this is a pattern, or who the killers are. I too am an aggressive rationalist. Perhaps I too am on a blacklist. By writing this column, I may have moved myself directly into the firing line. I am happy to take the risk. When I ask others to stand up to the Assassin’s Veto, I can do no less. I am Charlie.